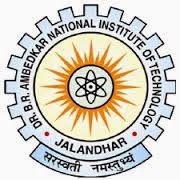 National Institute of Technology, Jalandhar (NITJ), also known as Dr. B. R. Ambedkar National Institute of Technology Jalandhar, is a public engineering institute located in the state of Punjab, India. It was founded with the name Punjab Regional Engineering College, Jalandhar (PREC) and as a joint venture of the central and the state governments. The Institute has issued Notification for PhD Admission 2014. Applications are invited for admission to Ph D programmes in various disciplines (Engineering, Management, Sciences, English Literature and Linguistics) for the academic session 2013-14 (Starting from January-2014). How to apply: : The application form can be downloaded from the institute website www.nitj.ac.in . Please submit separate application forms, if applying for more than one programme. Application form duly filled, accompanied by self - attested Photostat copies of the relevant certificates/testimonials /documents , alongwith a crossed demand draft of Rs.1000/-(Rs.500/-for SC/ST candidates) towards “application fee” drawn in favour of ‘Director, Dr B R Ambedkar National Institute of Technology, Jalandhar’ payable at ‘Jalandhar’ should reach the concerned 'Head of Department’ by due date as per the following schedule. The envelope must be superscripted as “APPLICATION FOR ADMISSION TO-----PROGRAMME (FULL/PART -TIME/SPONSORED) IN THE DEPARTMENT OF-----”.